Suggesting that the West Contra Costa Unified School District has “outstanding financial management” is akin to suggesting that the 7-9 Oakland Raiders had an outstanding season last year. Yet this is exactly what outgoing Superintendent Bruce Harter wrote in his recent April “Superintendent Message” that went out to all staff and was posted publicly on the District’s homepage. The fact is that until recently, school construction projects were not managed on the basis of carefully planned budgets! Instead, they were designed and managed “on scope,” a fanciful term meaning that cost was no object in pursuit of buildings with whatever features anyone wanted to include. The system of checks and balances that Harter cites was so weak that it took a whistleblower coming forward and alleging tens of millions of dollars of wasteful mismanagement (which Harter himself is asserted by the whistleblower to have “facilitated”) to get the board and the public to pay attention. The annual audits have been so flimsy that the school board was recently compelled to authorize nearly $1 million to conduct a full, independent forensic audit to uncover what’s been happening behind closed doors. What is most disturbing about Harter’s suggestion that costs have been kept in check is the stark reality that a huge $1.6 billion bond program is essentially out of money while thousands of WCCUSD students are still stuck in portables or buildings with worrisome seismic conditions, with few new facilities in operation. How could a well-run facilities program possibly produce that result? It is like saying that your personal budget worked perfectly when you run out of money halfway through the month and still need groceries. Harter then goes on to state that “our construction costs are lower than the averages in the Bay Area or Los Angeles,” citing costs per-square-foot. This is simply incorrect. The costs per-square-foot measure does not take into account either the bloated building sizes (at 150-225% of State averages) or the other “soft” costs (no-bid contracts to favored campaign contributors) where ballooning always happens — it’s like figuring only the cost of a steak without considering the hundred-dollar bottle of wine you’ve also decided to order. One might expect Bay Area costs to be somewhat higher, but WCCUSD’s new facilities are enormously more costly than the state average, when measured on a cost per student basis. For instance, the new Pinole Valley High School will be 268,000 square feet, 161% of the California average for high schools - if it had the 1,600 students for which it is designed. In truth, there are currently only 1,200 students, which means 223% of the benchmark, and by the time it is complete the District projects only 1,000 students, driving the ratio to 268%. On the soft cost side, the architect’s fee for this Taj Mahal is a whopping $14.8 million, or $12,300 per current student. For comparison, a full service charter high school campus at Hilltop was built recently by an outside foundation for a total construction cost, including land acquisition, of $30 million, or only about twice that of the Pinole project’s architect’s fees alone…stunning! A new Pinole Valley High School, with a $231 million budget, will cost nearly $200,000 per student! Let that sink in. Two hundred thousand dollars per student, half of the cost of the median home in Pinole. The average cost-per-student for California high schools is $61,000. From the experience of CoCoTax members serving for years on citizens school bond oversight committees in the county, we know that managing a facilities bond program is a complicated, complex and daunting task, one fraught with political challenges. However, we cannot mislead our way to an acceptable outcome. If we are going to move forward and provide the schools all of our students deserve, we must manage from a place of truth, transparency and reality. If voters and taxpayers are ever going to trust the District enough to support revenue measures in the future, district leaders must be open and truthful, and the board must hold accountable those who do not meet those requirements. The painful truth is that WCCUSD has not exhibited “outstanding financial management.” The plain truth is that district taxpayers have much higher tax bills, with less new schools to show for them, than do the taxpayers in other communities. However, it is also true that we now have an opportunity for a better future, since many of the actors involved in the mismanagement have left or are leaving the district. Sunlight, as it is often said, is the best disinfectant. We believe by shining some light on the reality of WCCUSD’s financial management, we are taking a necessary step towards a future where it can be said with a straight face that such management is more like the Warriors than the Raiders – truly outstanding. The Times editorial supporting the San Francisco Bay Restoration Measure AA misses the mark. This seemingly minor tax increase to finance shoreline projects is actually the proverbial camel’s nose under the tent. The proposed $12 annual parcel tax is grossly unfair and inequitable. Even though it amounts to what one might spend for lunch for two at McDonalds, it is a serious incremental burden for those seniors and others who are already strapped to meet the dramatically growing cost of living in this region - the highest in the nation. The owners of multi-million dollar commercial properties along the shoreline will pay exactly the same as the elderly widow struggling to stay in her small inland cottage, but they will reap huge hikes in property value. Under the “environmental” banner, there is a politically correct implication that the proposal must be worthwhile. Everyone is for a clean environment, but will this scheme really accomplish what it claims? Or, is it more likely that once launched, we will be asked for additional taxes down the road? As new regional agencies have evolved, local taxpayers have been asked repeatedly to pay new taxes for worthy infrastructure purposes. Yet, we have witnessed the state correspondingly decrease its traditional funding for those functions, instead diverting funds to pay for ballooning pension costs and social programs. In terms of jurisdiction, if the Bay is threatened by rising sea levels, why isn’t the US Army Corps of Engineers leading the way? It is chartered by Congress and funded by our federal taxes to manage all navigable waterways in the nation, and spends mega-billions annually in regions other than California. Why should the Bay Area pay higher taxes in order to lure back some of the money we send to Washington in the first place? It is well known that California is viewed in Washington as a reliable cash cow “exporter” of tax revenues to subsidize other states’ needs. So, what is the SF Bay Restoration Authority agency? Few knew of its existence before this tax proposal was announced, other than the various environmental groups and construction unions that stand to benefit financially from its activities. The board is considering a Project Labor Agreement, which will raise costs by 15-20%, and lock non-union contractors out of bidding. All publicly-funded projects should go to the lowest qualified bidder; PLA’s are bad public policy. The really scary thing is that this is the first “regional” government body empowered to levy taxes, and its governing board consists of officials NOT directly elected to the position; where is public accountability? If this measure passes, the camel will be back, again and again, sticking its nose deeper and deeper into our wallets. Proponents proclaim there is no opposition to this proposal, of which the public only recently learned. For over 75 years the Contra Costa Taxpayers Association has promoted “Good government at affordable cost.” We vigorously oppose this scheme, because it is neither. No good deed goes unpunished in the world of public union politics. The firefighters’ union and its cronies have attacked the efforts of two east county citizens to correct the local fire district’s underlying fiscal problem. Hal Bray and Bryan Scott formed the East County Voters for Equal Protection (ECV) to develop a relatively painless tax reallocation solution that will allow the district to reopen several shuttered fire stations, significantly improving emergency response in the area. They have the full support of the Contra Costa Taxpayers Association. The district has done little to correct its crippling unfunded pension obligation, a problem that can only be addressed if the board opens its eyes. It must reject the assumption that taxpayers will somehow foot the bill; municipal bankruptcies in Vallejo, Stockton and San Bernadino have shattered that myth. The unwillingness of the fire district board to even seriously acknowledge the problem is evidenced by the fact that they recently granted a 5% across-the-board wage increase, thereby exacerbating the pension shortfall. Area taxpayers are already struggling to make ends meet with recent tax increases at every level of government, and face a flood of new tax hikes on the June and November ballots. Most of these proposals are generated by the reality that unfunded public employee post-retirement obligations - whose disclosure is now required by new national accounting rules - represent hundreds of billions of debt statewide, and are clearly unsustainable. The tax reallocation proposal does NOT force any participating agency to cut its current spending. It does ask them to forgo a very small portion of their projected future tax revenue increases in order for the fire district to receive funding at the average of all the county’s fire agencies. Any of the government bodies involved should easily manage this shift, given the importance of effective emergency response. Bray and Scott do NOT oppose a parcel tax increase. They have made clear that if area voters wish to impose such a tax on themselves, so be it. They are focused solely on correcting a structural tax imbalance that has persisted for decades. “Sacred cow” school districts should NOT be exempt from contributing. These agencies receive by far the largest share of county property tax revenues. Any incident involving large groups of school children to which the fire department cannot promptly respond is potentially devastating. CoCoTax has met with various parties in east county and stands ready to work with anyone who is truly dedicated to finding sound long-term solutions to the dire need for better emergency response, but only at a cost taxpayers can afford. We do not wish to demonize firefighters, whose emergency response efforts we fully appreciate, but we vigorously oppose this campaign of lies and slander for the ultimate purpose of kicking the public pension can down the road. February 19, 2016, Brentwood, CA -- About a dozen members of the East County Voters for Equal Protection (ECV) met in the Brentwood Raley’s Event Center on Wednesday, February 17th, and reviewed the citizens action committee’s progress as well as short-term plans. The ECV committee has developed a program that would shift $7.8 million of the current $154 million in property tax funds collected within the fire district boundaries to the East Contra Costa Fire Protection District (ECCFPD), following procedures outlined in the California Revenue and Taxation Code and elsewhere. These funds would allow the district to permanently open and staff three additional fire stations with no additional taxes imposed on residents. The special assessments appearing on tax bills would not be effected. 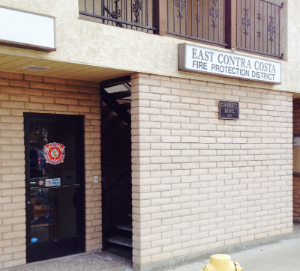 The ECV program calls for government entities, recipients of the 1% ad valorem property tax, to voluntarily shift a small portion of their property tax allocations to the fire district. District tax payers would not be asked to pay any additional taxes. Phasing in the program over three or four years would mean that no current budgets would be cut, and the reallocated amount would bring the ECCFPD allocation percentage level to approximately average for all fire districts within the county. Hal Bray and Bryan Scott, Co-Chairs of the committee, reviewed recent informal meetings with elected members of the Contra Costa Board of Supervisors, the City Councils of Brentwood and Oakley, and civic administrators. Meetings with candidates for the District 3 Board of Supervisor position, to be open in November of this year, were also discussed, as well as past and planned presentations to civic and service groups. The ECV is continuing to make progress in researching the leadership of the many Special Districts that receive property tax funds within the ECCFPD, in anticipation of garnering their participation. Members of the ECV reviewed their progress in setting up presentations to civic and service groups as well as progress in researching the leadership of the many Special Districts that receive property tax funds within the ECCFPD. Changes to the organization’s Facebook page were discussed, as were plans for a printed brochure. Members contributed $150 to defray printing expenses. The next ECV meeting will be held on Thursday, March 3rd at the same location, the Raley's Event Center, 2400 Sand Creek Road, in Brentwood. The Event Center is located within the grocery store, next to the Pharmacy. The public and all interested parties are invited to attend. “East County Voters for Equal Protection” is a non-partisan grass roots citizens action committee formed to address the unequal funding of fire and emergency medical services existing in 249 square miles of Eastern Contra Costa County. About 110,000 residents, as well as those who work and play in Eastern Contra Costa, have services funded at a level one-fourth to one-third of those levels in other parts of Contra Costa County. For more information contact committee Co-Chairs Hal Bray at hal.bray@pacbell.net or Bryan Scott scott.bryan@comcast.net. The group’s Facebook page is located at https://www.facebook.com/EastCountyVoters/ on the Internet. Tax propositions might rain down on Bay Area residents like an El Niño downpour this year as cities, counties, school districts and agencies try to persuade voters to pay for improved transit, smoother roads, school repairs, city building rehab, and bay water and wildlife conservation. Transportation authorities in Contra Costa, Solano, Santa Clara and Santa Cruz counties are planning sales tax elections. Santa Clara County is also talking about a sales tax to help the homeless. BART directors plan a $3 billion bond measure in Contra Costa, Alameda and San Francisco counties. AC Transit directors are talking about a bond measure for the bus system's Oakland to Richmond area. An obscure SF Bay Restoration Authority led the rush to the ballot box with a nine-county parcel-tax measure for the June election. The Walnut Creek City Council and the Walnut Creek School District are discussing measures; so are Orinda, Lafayette and its school district. Not to be left out: the city of Hayward and the Hayward Area Recreation and Park District. On top of that not necessarily complete list, Gov. Jerry Brown has said that the state needs new taxes and fees to maintain its transportation systems. The legislative fist fight between Democrats and Republicans over taxes vs. reallocating existing money has led to months of inaction. An initiative petition campaign has qualified for the November ballot a $9 billion statewide Public Education Facilities Bond Initiative for new and modernized school and community college facilities. "It does seem somewhat unusual," said Mark Baldassare, president of the Public Policy Institute of California. "Anyone thinking about asking voters to raise taxes or fees is aiming for the November 2016 ballot" that will draw more voters, he said. The rush to get a hand into residents' wallets unnerves taxpayer advocates. "Why didn't anyone tell me it was open season on taxpayers?" asked Kris Vosburgh, executive director of the Howard Jarvis Taxpayers Association. The "Clean and Healthy Bay Ballot Measure" on the June ballot would charge residents $12 a year, raising $25 million a year for 20 years to reduce trash and pollution, improve water quality, restore habitat, improve shore access and protect against floods. Another taxpayer advocate cast a gimlet eye over the ballot prospects and said he was appalled. "We're certainly challenged just to keep track of them," said Jack Weir, president of the Contra Costa Taxpayers Association. "We have to solve the problem," he said. "We can't continue to spiral into fiscal insolvency." "We have 482 cities, and it is hard to make a general statement," said Mike Coleman, a fiscal adviser for the League of California Cities and the California Society of Municipal Finance Officers. "Each community is in a different place on pension and health benefits," he said. And, until the final decisions come down, it won't be possible to say whether it will be an unusual election year. Whatever happens, Weir said putting such a number of tax measures before voters would lead many to say, "Hell, I can't afford this," and vote no on all of them. Community Choice Aggregation, also known as Community Choice Power, has landed in San Francisco, Sonoma and Marin counties and crept into Contra Costa via Marin Clean Power in Richmond. Contra Costa County is now considering going “full steam ahead”, if you pardon the pun, as a Community Choice provider via a government JPA (Joint Powers Agreement) with local city governments. Let’s hope not. Community Choice Aggregation is government at its worst. Government has proven incompetent at regulating PG&E so now it wants to ratchet up its efforts by giving local governments the power to make PG&E their indenture servant and us its ultimate victims. - Gives the JPA the abusive roles of partner, competitor, regulator and taxing authority over PG&E and their joint customers - us. Community Choice Aggregation is coercive in several ways. The 2002 legislation that created Community Choice Aggregation allows for a sophisticated, uncompensated “taking” by local government without payment by forcing PG&E into a “master/slave” relationship with government agencies. PG&E must do ALL the work: build and maintain the distribution system, the billing system, the customer relationship system, and the support systems needed to run a utility. PG&E must hire, train, and manage the employees that perform all the work and handle all interaction with customers. Government just takes the profits. CCA is also coercive in its implementation. The legislation creating this monster mandates that all residents in the geographical area of the JPA are automatically switched to the JPA as customers. To not be switched, a customer must beg (“opt out” in government terminology) to stay with PG&E. It is government force substituting for a marketing and sales capability. Why be good when you can be government? Next, a government JPA pays no taxes. PG&E does. Who is going to make up for the loss of tax revenue? There is a reason there is no mention of taxes on the Marin or Sonoma clean energy websites. Community Choice aggregators frequently brag about being less expensive; when they actually are in it primarily because they pay no taxes (and can tax PG&E their “competitor”). Their tax advantage also allows them to use tax free bonds to purchase or build power generation facilities, again giving them a competitive advantage in the market and reducing tax income for government. Who do you think will be forced into making up for the lost tax revenue? A Community Choice aggregator can also legally misrepresent the quality of their service by delivering coal or natural gas powered electricity without telling their customers. How? By purchasing “unbundled” (not attached to any specific project) Renewable Energy Certificates. RECs are certificates sold in the open market that allows the buyer to claim legal ownership of 1 megawatt of renewable energy anywhere in the world. Originally accepted in the financial marketplace these certificates have been found to be deceptive and have lost favor with investors. And I’m sorry, but there is not enough “green power” to meet the claims of Community Choice Aggregators and I find this deception reprehensible. Finally, there is something inherently wrong with a program that allows government to be the partner, competitor, regulator and taxing authority over a company and an entire industry. Or as the old saying goes, “power corrupts, absolute power corrupts absolutely”. We, as citizens, rightly give some coercive powers to our government. Policing, taxing, and regulating are powers needed to be a government. Giving Community Choice Aggregators the powers detailed above is wrong and needs to stop here. Click on the link to scroll through the slides. Please read the President's Report for more information on the presentation.